Most smokers are familiar with the damage smoking does to their insides. Lungs clogged with smoking debris and poorly-functioning arteries, leading to increased risk of heart disease and cancer, have been the subject of hard-hitting anti-smoking campaigns for years now. But what about the sometimes invisible damage to your outward appearance? The ill effects of smoking arenâ€™t so obvious when youâ€™re younger but as you age they become increasingly evident. Just look at the damage cigarettes have done to Kate Mossâ€™s formally perfect visage or that of anyone whoâ€™s been smoking for the vast majority of their life. Not only can these side-effects be off-putting but they can be costly to reverse cosmetically. While dark circles under your eyes can be hereditary, they can be exacerbated by smoking. The theory is that nicotine withdrawal causes disturbances during sleep; and less sleep means more pronounced bags. Veteran smokers also develop looser skin around their eyes which can enhance dark circles. Most of us develop thinner hair as we age; itâ€™s just a fact of life. But some studies have suggested that if you smoke youâ€™re more likely to go bald. Researchers in Taiwan have found a link between smoking and male-pattern baldness in Asian men. To avoid the negative effects of smoking but still get a nicotine hit, many are turning to e-cigarettes, such as the popular TABlites smok e cigarette. A regular smoking habit can have a dramatic effect on skin tone. Circulatory problems can lead the skin to be deprived of oxygen and nutrients which can in turn cause uneven pigmentation and a pallid complexion. According to dermatologists, these effects can develop in smokers from an early age. Chronic smokers put a lot of strain on certain muscles that nonsmokers donâ€™t regularly use, in particular those around the lips. Coupled with the loss of elasticity associated with smoking, this causes dynamic wrinkles, deep lines around the lips. of the iceberg when it comes to oral hygiene. Smokers are twice as likely to lose teeth compared to non-smokers and more likely in general to suffer from gum disease,bad breath, and develop oral cancer. Other less common problems are inflammation of the salivary gland and increased loss of bone within the jaw. 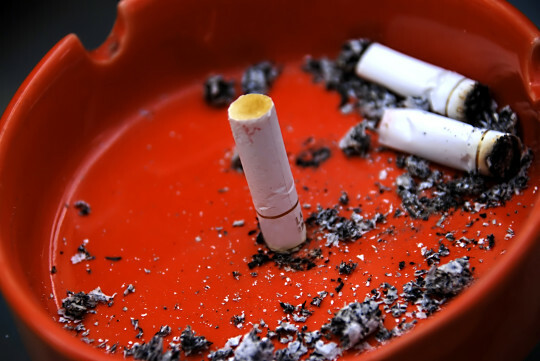 Recent studies have suggested that smokers have a greater risk of developing psoriasis. The condition most often causes thick, scaly patches on the skin – most commonly on the knees, scalp, hands, feet, elbows and back. Apparently the risk of developing the condition only falls back to normal 20 years after quitting. Itâ€™s not only your face and head that bear the brunt of the damage from smoking; your figure suffers as well. Researchers have identified smoking as the leading cause of sagging breasts – smoking causes skin everywhere on the body to lose its elasticity by damaging collagen and elastin, and parts that were once firm begin to droop.